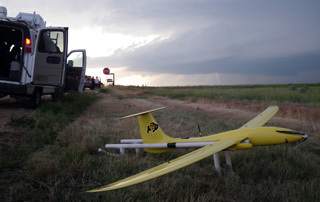 There were a few surprises along the way, but winding up wrecked in Kansas was not among them despite several supercell intercepts by an unmanned aircraft team from the University of Colorado at Boulder in 2010. The team hopes to return to the skies soon, with a little more room to maneuver. Their experience is helping to shape national policy on the management of unmanned aircraft within the National Airspace System. Flying in the spring of 2010 as part of the massive VORTEX2 (second Verification of the Origins of Rotation in Tornadoes Experiment) project, the university research team managed to fly where few would dare. 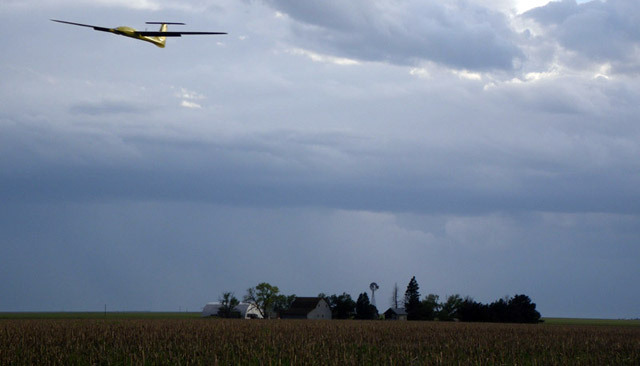 Operating an unmanned electric airplane with a 10-foot wingspan, they targeted, at low altitude, the rear flank downdraft of a supercell. Researchers were testing a hypothesis that this part of the storm has a critical role in the formation of a tornado. The winds they encountered were, if anything, surprisingly docile—about 50 knots maximum velocity—though that should not encourage anyone to repeat the feat in a manned aircraft. What they learned about the genesis of tornadoes is still being sorted out, but the team expects to be back in the air tackling other scientific questions in the next couple of years. Eric W. Frew, associate professor and director of the university’s Research and Engineering Center for Unmanned Vehicles, said the unmanned aircraft, named Tempest, validated the viability of using unmanned systems to learn about severe weather, along with wildfires, turbulence, and general atmospheric science. The unmanned aircraft can collect wind speed and other data on a scale of detail not otherwise possible, and the team worked through many of the operational challenges. Their strategy and methods, much of which was mandated by the FAA in the interest of keeping the unmanned aircraft system well separated from manned aircraft, offer insight on what the coming integration of unmanned vehicles in the NAS might look like. “We’re continuing to work with the FAA on how to do these types of missions better,” Frew said. The FAA granted permission to operate Tempest, adapted from a hobby industry sailplane design, in an area spanning portions of Colorado, Kansas, Nebraska, and Wyoming. Roughly 24,000 square miles of airspace was divided into about 60 smaller sections, with an altitude restriction of 1,000 feet agl in most areas. A 400-foot agl limit was imposed for some areas “because of their proximity to airspace reserved for emergency approaches,” the team notes in a mission analysis published in the November 2012 edition of Journal of Aircraft. The low altitude made it a challenge to fly across the rear flank downdraft, a region of the supercell which, by definition, is producing a considerable amount of wind aimed directly at the ground. Despite this constraint, the team was able to traverse the rear flank downdraft twice, gathering data still being crunched, along with radar and other measurements taken by the rest of the VORTEX2 armada, which included, all told, about 40 vehicles. Frew said other constraints proved more difficult to navigate. he FAA required two hours’ notice before activating up to four of the smaller areas (boxes roughly 20 miles square, though the shapes and sizes varied). Only one of the four smaller areas could be flown at a time, with 30 minutes of advance notice required for each flight. That, Frew said, challenged the meteorologists to predict where a storm would develop well in advance, and limited the team’s ability to stay in contact with supercells they were able to intercept. “The storms seemed to find exactly the boundaries and avoid them,” Frew said. The FAA insisted on two hours of lead time for the overall operating area in part to allow notification of affected pilots and controllers, though Frew hopes for compromise on future missions, including a one-hour notification requirement. The team also hopes to be able to activate more than one box at a time, allowing more flexibility to track storms notorious for erratic movement. Tempest was powered by an electric motor and cruised at 42 knots (more than twice that speed in a descent), and posted climb rates as high as 2,300 fpm for short periods, thought 500 fpm was more typical. Flown by a closely monitored autopilot, Tempest was electronically “leashed” to a tracker vehicle by an on-board GPS receiver that forced the unmanned aircraft system to stay within half a mile of the spotter on the ground. The spotter in that vehicle was required to keep Tempest in sight at all times. The pilot, a professional hired for the project, updated the GPS waypoints to steer Tempest within those limits, and controlled the aircraft from another vehicle. Frew said valuable data was gathered despite the challenges, and the team hopes to launch more flights into severe weather in the coming years, perhaps as soon as 2014. Funding and regulatory approvals remain to be secured, but Tempest proved that an unmanned aircraft can play an important role advancing science in a number of areas. Tempest discovered a second gust front that was previously unknown, along with measuring wind velocities more docile than predicted. Frew said the university center plans a range of future missions, and has forged a good working relationship with FAA officials. “We have found them to be very receptive,” Frew said. To read this article from the Aircraft Operators and Pilots Association click here.